Have you ever wished you could make a game in MAME louder? Get rid of the game warnings screens (such as video emulation not 100% accurate)? How about smoothing out the frame rate so it exactly matches your screen refresh? Or skipping a game's initialization displays? All this and more is available in this excellent set of patches from Alan Kamrowski II (SA Dev). Just run the included batch file, choose the features you want patched, and the new features will then be available in MAME as startup flags (such as "-skip_startup_frames"). These are some great features, and can be used to really improve the "MAME Experience," especially on cabs — for example, you can startup Galaga in 2 seconds instead of 16 (and skip the initalization displays) by adding "-ssf 870" to the game initialization (which skips the first 870 frames). In reviewing my site's referrer stats today, I ran across a very cool site, "Jake's Misc Arcade Info Page." It's a simple page, but it's the content that matters, and Jake's got some neat stuff, ranging from the unusual (how to make a stained glass MAME marquee) to the downright useful, such as an online MAME database that allows you to search and generate lists of MAME games, sorted on everything from number of players to the screen frequency used. I've made arrangements to review the Devastator II controller from Treyonics. It was a pleasant surprise to find out that the president of Treyonics, James Krych, lives just a few minutes from my home in Cleveland, Ohio. (In fact, after hearing about my back surgery, he's even going to be bringing the controller to my house personally! How's that for service? ;-) It'll be a week or two before we can hook up, but I'll get the review done as quickly as possible after I've put the Devastator through its paces. The site changes I talked about begin...slowly. I've updated the search features for RetroBlast, allowing for a quick Google search of the site from any page. It's a tiny little change, and yet every page on the site is affected, so if you find a broken link please let me know. The Ultimate MAME Gaming Machine? If you've got the bucks, this may be the ultimate gaming station. 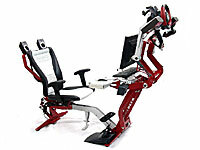 The Navis, from Gamedeck Videogaming Equipment, looks like some sort of sophisticated exercise equipment, but it's actually a computer desk, complete with drop down arms for all of your gaming controls (including driving controllers). It even has an optical drive neatly mounted under the mouse area. Looks to me that all this game station needs for ultimate gaming nirvana is a nifty arcade control panel arm. Very expensive, but also very cool. I just ordered a new slimline external DVD/CD-RW drive for the MAMEframe2. While the cab already had a combo DVD/CD-RW drive, I needed one that I could easily access from the outside of the cab (since my youngest son loves playing his favorite educational CDs on the MAMEframe, and who can blame him?) With the slimline drive measuring only 5.37" x 5" x .75", I should have no problem mounting it on the cab. I'll post pics after it's installed. I've made arrangements to review the EOps Motion Sensor Gun as soon as it's released, which according to EOps will be in late April, right before the E3 (Electronic Entertainment Exposition) show on May 12-14th. If you've tried to play Terminator 2 in MAME, you've discovered that you first have to calibrate the "guns" (which were actually analog joysticks with guns attached to the top). If you're having trouble getting the game properly calibrated in MAME, I've just uploaded a pre-configured NVRAM file, which is available from the Retroblast File Downloads Page. Happy Cyborg Blasting! This picture is of two T-Stik Plus Balltop joysticks, one installed in a metal mounting plate and the other directly into my 3/4" wood "test panel." The green joystick in the middle is a Happ Competition joystick, included for height comparison. SlikStik just released a new single player controller yesterday, and from the look of things, it's going to be great for single-player gaming. It's got two joysticks (great for Robotron ;-) and even has pinball buttons. It will be using a standard IPAC controller, meaning that reprogramming the key assignments will be a cinch and there may even be room for future "homebrew" additions. Since I'm still spending a lot of time on my back while by back heals, I thought I'd recommend another good pinball book that I just finished reading, Pinball Memories by Marco Rossignoli. 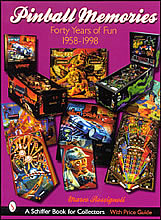 This once examines a different pinball machine manufactured each year from 1958 to 1998, and includes lots of details, including rulesets and even "collectability" of the machine reviewed. There are lots of great color pictures, and like before, the pictures in the book are all available as poster prints from the author's web site. I'm still healing, and feeling better. I'm still limited to 10 minutes sitting per session (30 min. max a day), so it makes writing reviews hard. That said, I am getting in a lot of play time on the MAMEframe, and am making plenty of plans for future reviews. Once I get the go-ahead from my doctor in 2-3 weeks, I'm going to start cranking out the reviews! The surgery was a success, and although the recovery has had some exciting moments (I reacted badly to the narcotic "pain pump" and went non-responsive and stopped breathing), I'm alive now. I hate to do this, but there will not be any updates to RetroBlast for a while, as I'm going into the hospital to have back surgery on Thursday (3/4/04) and don't know how soon afterwards I'll be able to do any work on the site. I'll try to post news when I can, but don't expect anything anytime soon.